The decline in soft drink consumption among Australians has slowed. For young Australians aged under 25 years, soft drink consumption is actually increasing year-on-year, according to new findings from market research organisation Roy Morgan Research. “Back in 2007, 59 per cent of Australians drank soft drinks in an average seven days. In the ensuing years, this figure decreased dramatically, and now sits at 48 per cent,” said Angela Smith, Group Account Director, Roy Morgan Research. “Coca-Cola was one of many brands affected by this downturn,” Ms Smith said. “However, between 2013 and 2014, the decline has slowed, with the proportions of soft drink and Coke consumers changing very little,” she said. The findings showed that consumption of Coca-Cola branded soft drinks saw an increase in young people, despite the brands’ distributor in Australia Coca-Cola Amatil recently reporting its lowest profit in eight years, and a decline of 21.3 per cent in earnings in its beverages business. Ms Smith said that in the case of young Australians aged under-25, soft drinks had actually experienced a surge in popularity over the last year. Roy Morgan Research said the findings showed that in 2014, 56 per cent of Australians aged 14-24 drank at least one soft drink in an average seven-day period, up from 53 per cent in 2013. “Not only are more under-25s consuming soft drinks, but they are the only age group whose average individual consumption has increased, from 5.7 glasses in an average seven days to 6.2 glasses,” Ms Smith said. The clear market leader was the Coca-Cola brand including Coca-Cola as well as sub-brands Diet Coke, Vanilla Coke and Coke Zero. Thirty-eight percent of 14-24 year olds drank at least one Coca Cola-branded soft drink in an average seven days (up from 35 per cent in 2013), with year-on-year increases for Coca-Cola, Diet Coke and Vanilla Coke. 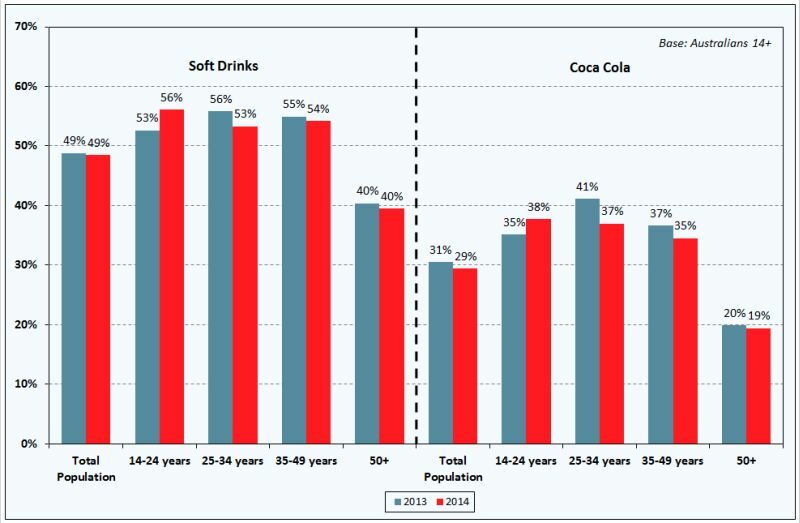 In contrast, Roy Morgan Research found that 25-34 year-olds showed the most marked decreases, both for soft drinks in general and for the Coke brand. In 2013, 56 per cent consumed at least one soft drink in any given seven days, but in 2014 this figure fell to 53 per cent. The proportion who consumed Coca-Cola soft drinks in an average seven days went from 41 per cent to 37 per cent. The proportion of Australians aged 35-49 drinking soft drinks in an average week fell fractionally from 55 per cent to 54 per cent (although there was a more noticeable decline in their Coca-Cola drinking: from 37 per cent to 34 per cent). The 50+ demographic, traditionally the least zealous soft drink consumers, remained stable at 40 per cent. The proportion drinking the Coca-Cola brand barely changed either (20 per cent to 19 per cent year on year). “It is imperative for soft drink manufacturers to have a detailed understanding of their consumers in order to fully understand and profit from these rapidly changing market trends,” Ms Smith said.